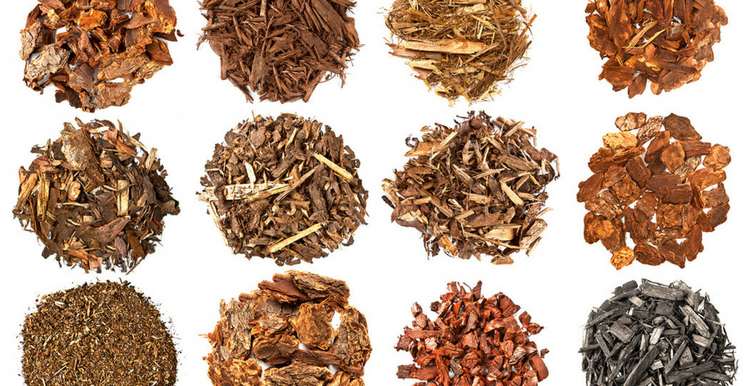 It turns out there is a lot to love about mulch. Aside from clearly defining a beautiful and functional yard, mulching can help conserve and nourish surrounding soil, preserve moisture, and protect plants and trees from mower, trimmer, and insect damage. Aim for 2-3 inches of mulch for proper coverage and consider an additional barrier (like landscape cloth) to hold the mulch in place and increase weed protection. Alas, all mulch is not created equal, which is why we’ve dedicated this article to the seven most popular forms of mulch and the best ways to use them. Sometimes you just want your garden beds to rock. Literally. Stone mulch is the heaviest and longest lasting of mulch types, so it’s worth committing to if you don’t want to repeat trips with the wheelbarrow every few years. Perfect for heat-loving beds and borderline hardy plants, landscape stones absorb heat during the day and make it available to plants throughout the day. (Watch the heat absorption on the hottest days, however; it can cause faster water evaporation). Use a heavy landscape cloth underlayment to keep minimize weed growth and the depth of your layer. Whether you have your own wood chipper or grab what you can from your favorite tree service (who will often give it to you for free to avoid dump fees), fresh wood chips make a great long-lasting mulch that won’t blow away or float. To prevent them from robbing the soil of necessary nitrogen as they decompose, make sure to keep them on top of your planting beds. (Don’t worry, they’ll release the nitrogen back eventually, becoming a great long-term fertilizer). Wood chips are also a perfect choice for informal paths. You really can’t go wrong with shredded hardwood when it comes to availability and durability. Lasting one to three years, it is easy to carry and spread, and is a solid choice for creating a natural look in landscape beds and woodland paths. To prevent it from forming a “crust” after the first year, break up the top layer every spring and dress each bed with an additional lightweight layer to renew its appearance and weed suppression ability. Here in the South, we know all about pine straw. It’s cheap. It’s everywhere, and it’s easy on the back. We love how its burnt-orange color looks like it belongs in any landscape, and it certainly works hard enough to prove it. Pine straw is available by the bale, the truckload, or for free under pine trees, and it lasts up to two years, although you may need to fluff or top it off every so often. It’s fairly common knowledge that mulching your grass is the best for your lawn. (In this case, “mulching” means allowing the discarded plant material to bed back down in the lawn as a source of nutrition and weed management). However, when your lawn grows too fast, it’s best to bag it and apply the clippings as a solid mulch layer for other areas in your yard. Vegetable gardens in particular love grass clippings at their feet. One caveat: if your lawn has been treated with chemicals, steer clear of your food beds. Here’s where we let you in on a little secret. We don’t rake our leaves anymore. We mulch and bag them in the lawnmower and then use them to dress our fall beds. This highly nutritious (and much less labor intensive) fall practice creates a uniform look that tucks garden and flower beds neatly into their winter season. The only downside is that chopped leaves tend to blow away easily, so hose them down a bit after applying to weigh them down. Mulch is an excellent weed suppressant, but it won’t do much for bugs; in fact, you may find it increases the number of lawn insects as they work to break it down. Extend the life of your mulch by laying down a layer of insect control granules prior to your mulch layer, and protect your plants from insect and disease damage by making sure mulch is kept two to three inches away from stems and trunks. Need to control weeds in other areas of your yard? Try a broadleaf weed killer specifically formulated to keep the plants you want and suppress the ones you don’t. We are here to help with your yard all summer long.